Jimmy Gage had been in difficult situations. Not only as a Dark Ops operative sent on dangerous missions, but he had also been help captive. None of that prepared him for the USO performer he helped rescue when their boat sank. Even wet and bedraggled as he pulled her to safety, she enticed him. He wanted her to return home until they found out why the boat exploded, she was equally determined to finish her commitment. Chloe Nelson had lived with being sick and scared. Being given a second chance at life allowed her to live life to the fullest. Not that she intended to act carelessly and intentionally put herself at risk, but if she was told they were safe, then they were safe. Jimmy would simply have to deal with her being here. It wasn't only Chloe that was keeping Jimmy on edge. A friend of his was missing, and there may be a terrorist plot at work. He lived and worked in a dangerous world, and he didn't need the distraction Chloe presented. 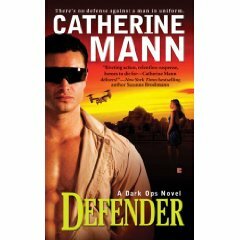 Defender was a wonderful introduction to Catherine Mann's new Dark Ops series. The members of the Dark Ops are hot. Not just in looks, but in their dedication to their country and their team. They put their lives on the line, and infiltrate the deepest recesses of terrorists cells. Jimmy is the epitome of one of these heroes, especially once he focused his protective instincts on Chloe, regardless of her opinion. Defender is an action packed, intense, passionate romantic suspense that will leave readers anxious for more.